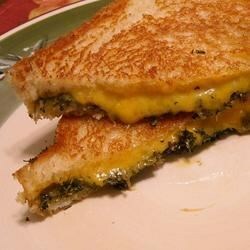 "This grilled cheese sandwich has a garden twist." Spread 1/2 tablespoon of butter on one side of each piece of bread. Lie the slices of Cheddar on one of the slices of bread on the unbuttered side. Sprinkle the parsley, basil, oregano, rosemary, and dill on the other slice of bread on its unbuttered side. Sandwich the two slices of bread together with the buttered sides facing outwards. Heat a skillet over medium heat. When skillet is hot, gently lie the sandwich in the skillet; cook on each side for 3 minutes until cheese has melted. The ultimate 3-in-1 eggy, cheesy breakfast sandwich! Great twist on a classic. I added bacon to mine and it came out perfect. Herbs added pizzazz alright! What a good idea. Great idea! I used italian herbs in place of the spice mixture recommended and it was delicious!! delicious! thanks for this new twist on grilled cheese!